7 Ways To Wear Comfy Clothes And Look Super Stylish! No matter how hot or cold it is outside...when it comes to dressing up, comfort is the most important factor to keep in mind. There are lazy days when you just don’t want to put any effort into dressing up at all and be as comfortable as you can. But dressing comfy doesn’t always have to mean wearing sneakers or loose fitted clothes. Here are some fabulous ways to help you dress comfy without sacrificing style. When the weather gets cold outside, we love to be as comfortable as possible because of the number of clothes we have to pile on to keep warm. Wearing a polished gorgeous jacket or an oversized coat is the ideal way to automatically look more stylish and well put together. So you might as well invest in that gorgeous jacket you have your eyes on! We cannot deny how much we love the oversized blazer trend. These loose fitted blazers, also known as boyfriend blazers, make for the easiest way to up your look and make your ensemble instantly more stylish. They not only look chic but they are also super comfortable! Plus they are so versatile, they look good with almost anything. 3. Joggers are stylish? HELL YES! If you are one to always be in the loop about the latest trends, then the term Athleisure is not new to you. If you are one to not follow trends, but you just love the comfort of joggers and jumpers, then you will more than pleased to know that’s the latest trend right now. Wear joggers and still look in vogue? What a wonderful time to be alive! 4. Do the Canadian Tux! What is the Canadian Tuxedo, you ask? It is nothing but denim paired with denim. 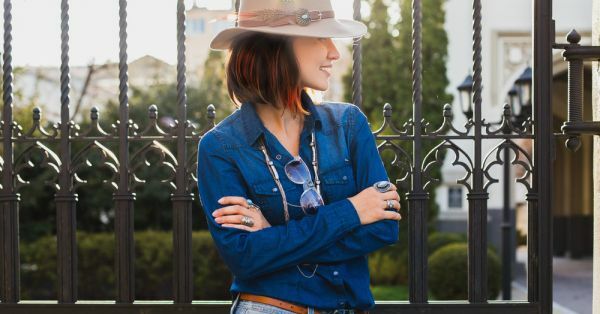 Denim is known to be the comfiest item of clothing we have ever had, and wearing a denim shirt on top of denim pants is a classic trend that will never go out of style. 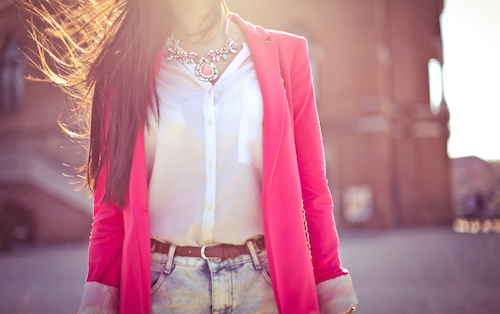 Stay comfy and look like a fashionista by owning this look! Accessories can give that extra edge to your look even if you are wearing something bland. If you are in a hurry or you don’t feel like dressing up, just wear a plain top with jeans and throw on a statement necklace to automatically make your ensemble stand out! Such a breeze, right? If you want to look stylish, it is all in the details! We often turn a blind eye to our choice of fabric and other tiny details which makes a huge difference. Play with different kinds of designs and aesthetics like fringed pieces, mesh dresses or sheer. Even if you wear these with your running shoes, you will still look stylish. No questions asked. This is, hands down, the most important thing when it comes to dressing comfortable. Uncomfortable shoes can ruin your whole look, even though you might be wearing gorgeous designer dresses. They affect your posture, the way you walk and also your mood. Make sure you invest time and effort into finding shoes that are perfect for you. Images: Shutterstock HAVE A STORY IDEA FOR POPxo? If you want to hear about it, we can write about it! Just tell us your idea here! MUST-READ: Here’s How You Know THAT Dress Is Perfect For You! MUST-READ: Are ALL Your Outfits Looking The Same? 7 Ways To Change That!